“You will have your work cut out for you. We’re confident you will get things done,” the apostolic nuncio to the United States said during bishop’s installation April 2 at the Cathedral of the Immaculate Conception as the sixth bishop of the Diocese of Memphis. “The Holy Father has appointed you to shepherd this portion of the people of God, to be a true father and pastor, and bring them healing, unity and hope amid the storms of this world,” Archbishop Pierre said. Over 1,000 people attended the invitation-only installation Mass. Besides Archbishop Pierre, other prelates in attendance included Archbishop Joseph E. Kurtz of Louisville, Kentucky; retired Bishop J. Terry Steib of Memphis, who headed the diocese from 1993 to 2016; and Cardinal Justin Rigali, retired archbishop of Philadelphia, who now resides in Knoxville, Tennessee. The installation was broadcast live on the diocese’s website, Facebook page and YouTube channel. During his homily, Bishop Talley referenced the first reading, from the Book of Ezekiel, Chapter 26, verses 24-28, from which he receives his episcopal motto, “He will give you a new heart.” He offered words of gratitude and encouraged the faithful in West Tennessee to be transformed by a new spirit and a new heart. Pope Francis appointed Bishop Talley to Memphis March 5. He succeeds Bishop Martin D. Holley, who was directed by the pope to step down as bishop of Memphis. Archbishop Kurtz was serving as apostolic administrator until the new bishop’s installation. At the time of his appointment, Bishop Talley, 68, was the head of the Diocese of Alexandria, Louisiana. He was named coadjutor of that diocese in 2016 and automatically succeeded Bishop Ronald P. Herzog when he retired in 2017. Ordained a priest of the Atlanta Archdiocese in 1989, he served in various roles for the archdiocese over a 23-year period. 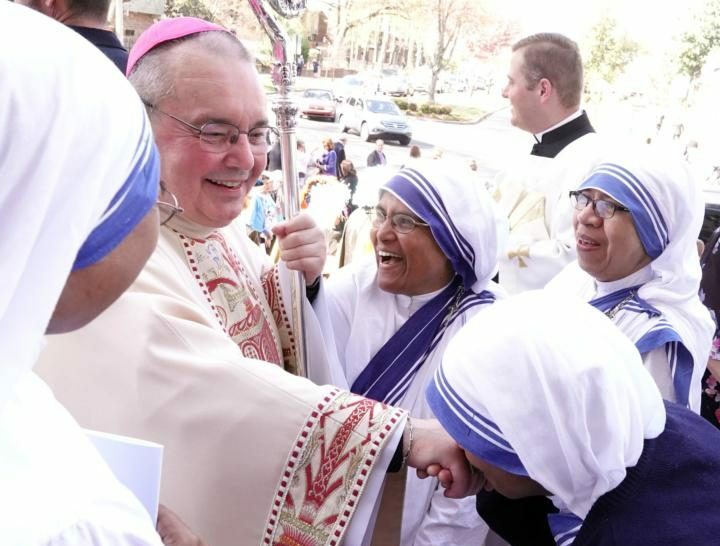 He was ordained to the episcopacy as an auxiliary bishop for Atlanta in 2013. During his April 2 installation, Archbishop Pierre referenced Memphis’ connection to the Rev. Martin Luther King Jr., who is a personal hero of Bishop Talley. Rev. King was assassinated at the Lorraine Motel in Memphis April 4, 1968. Bishop Talley visited the National Civil Rights Museum, which is located at the site of the Lorraine Motel, with friends and family April 3, the day following his installation. The bishop was raised a Southern Baptist and decided to become a Catholic while he was a student at Auburn University in Alabama. Bishop Talley will visit over 25 parishes over the next two months to visit the faithful throughout the Memphis Diocese, which encompasses 21 counties and over 61,000 Catholics. “I’m overwhelmed with love and feel welcomed, and that leaves me with a full heart,” Bishop Talley said. Simkanin writes for Faith West Tennessee, the magazine of the Diocese of Memphis.